Download and share the event flier. The [National Pain] Strategy envisions an environment where people with pain have access to educational materials and can learn effective approaches to prevent, cope with, and reduce pain and its disability." 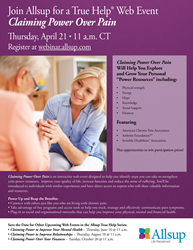 Allsup, a nationwide Social Security Disability Insurance (SSDI) representation company, will host the Web event, “True Help Claiming Power Over Pain,” on Thursday, April 21, from 11 a.m. to 12:30 p.m. (CST). The first in the 2016 series of Web events created to empower individuals living with chronic illness and disabilities, “True Help Claiming Power Over Pain” will help individuals strengthen their personal power resources to improve quality of life, increase function and reduce the sense of suffering.